The Philips 8901 Ambilux TV brings a rave to your front room | What Hi-Fi? The Philips 65PUS8901 is a TV with nine tiny projectors, delivering the most eye-catching Ambilight performance yet, plus 4K, HDR and Android TV. 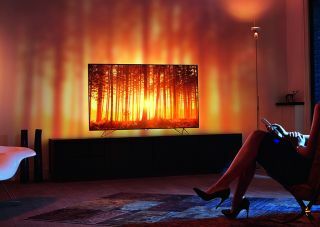 The high-end Philips Ambilight TV, which launches today, wants to turn each viewing session into a private rave. If you’re bored with your TV just being a TV, you’re in luck. This is a 65in TV with 4K and HDR compatibility, running on Google’s Android TV interface. The most eye-catching technology, however, is Ambilux: nine tiny projectors that fire out of the TV’s backside. Ambilux is the latest iteration of Ambilight, a Philips staple used to create a halo of light around your TV. The idea is to expand the picture beyond the bezels to create an experience that is simultaneously more immersive and more comfortable for the eyes. Where Ambilight’s strips of LEDs simply beam some colours to match those on screen, Ambilux’s projectors offer enough definition and dynamism to partially replicate the video content. The idea is to take advantage of your peripheral vision and make you feel like your picture is larger than it is. You can adjust the size of the halo, as well as its level of definition – whether you see vague blurs of colour or, for example, some trees. Philips suggests starting with the mildest setting and working your way up to ‘extreme’. Ambilux can also be made to follow the sound being played, instead of the video. Put this on and you’ll get a light show of psychedelic equaliser effects. The company is also working on a Euro 2016 companion app, which controls the Ambilux projectors and uses them to beam flags on your wall. Perfect for the die-hard fans, although it won’t improve England’s chances of winning. The Philips 65PUS8901 was first unveiled at IFA 2015 in Berlin, but it is only now hitting stores. It is available for preorder now in the UK for £3999, with shipment expected at the end of March. Knightsbridge-based department store Harrods has a three-month exclusivity deal, after which the TV will be stocked at considerably more navigable locations.